Fountainhead Park Summit is a 4.6 net-acre land parcel fronting the I-10 Freeway at the Broadway Curve, the most heavily traveled and highly visible stretch of Freeway in the state of Arizona. 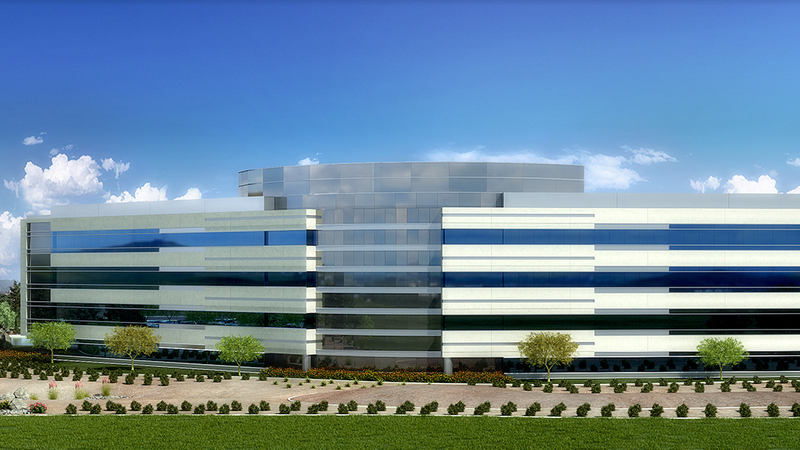 The site is directly adjacent to the 439,070 RSF Fountainhead Office Plaza A&B that Metro developed and leased to the University of Phoenix in 2011. Metro Commercial Properties sourced an acquisition contract on behalf of USAA Real Estate Company and processed architectural site plans and City of Tempe zoning and site plan entitlements for a 14-story, 384,300 RSF office tower with parking in a 5-level parking structure. Design and acquisition was complicated by proposed highway expansion by the Arizona Department of Transportation (ADOT). Metro guided USAA through the Voluntary Acquisition Program with ADOT and successfully negotiated the sale of 1.4 acres of land (112’ of frontage) to ADOT without negatively impacting the entitlements of the site, and in turn materially reduced the land basis of its capital client. 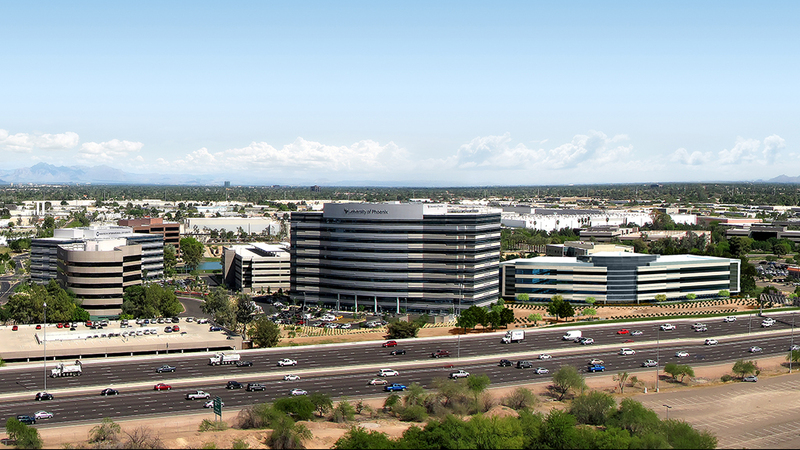 The acquisition of the site and subsequent sale of right of way to ADOT concluded in 2012, and the team at Metro engaged the services of a third party brokerage firm to market the site for a build-to-suit corporate headquarters. Sensing a prolonged recovery in the office market, Metro strategically redesigned the planned office improvements into a more immediate development opportunity through administrative modification of the site plan and elevation for a more value-office design, featuring a 4-story 160,000 square foot Class A office with an 800 space garage (5.0 / 1000 SF). 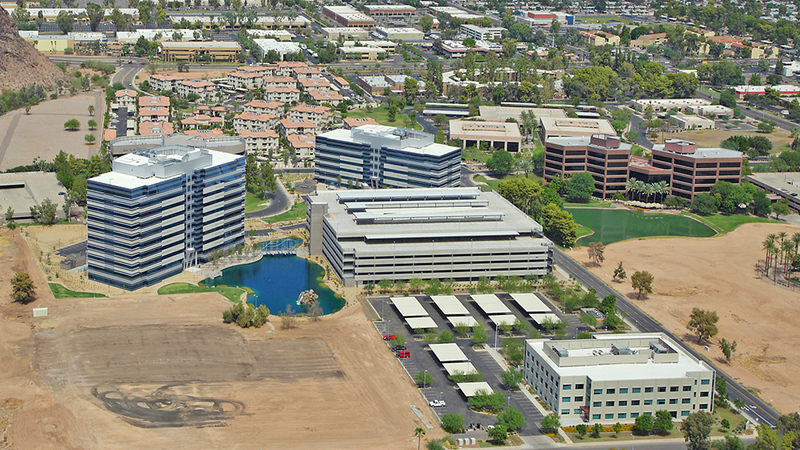 The density of the entitled development rights of 384,300 RSF in 14 stories, coupled with ability to created decreased project scale through administrative site plan modifications allow Metro/USAA to market the LEED® targeted project to a diverse group of back-office and corporate headquarter uses that desire the labor reach of the central Tempe location, and the high visibility/exposure that the 225,000 daily cars passing along the I-10 freeway bring to the site.